I typically associate baked apples with fall. But they are much too delicious to only eat them for one season! Besides, our farmer's market offers apples year-round thanks to the orchards large storage space. So, baked apples in the heart of winter are just as delicious for dessert or a snack as they are in the fall. I use a fairly small amount of maple syrup. You can certainly drizzle more over the top once they've finished baking if your hungry group prefers them a bit sweeter. Sometimes I add a handful of scrumptious homemade granola instead of the nuts and raisins. That's equally delicious. Throw these in the slow-cooker once dinner is up and running, and by the time your family is getting a sweet tooth, you'll be enjoying piping hot, freshly made dessert. Now that's the perfect end to the day! Wash the apples. Remove the tops by cutting straight across (see photo) and then remove the core. ( I find using a small spoon or scoop is easiest to do this). Discard the core but keep the top. 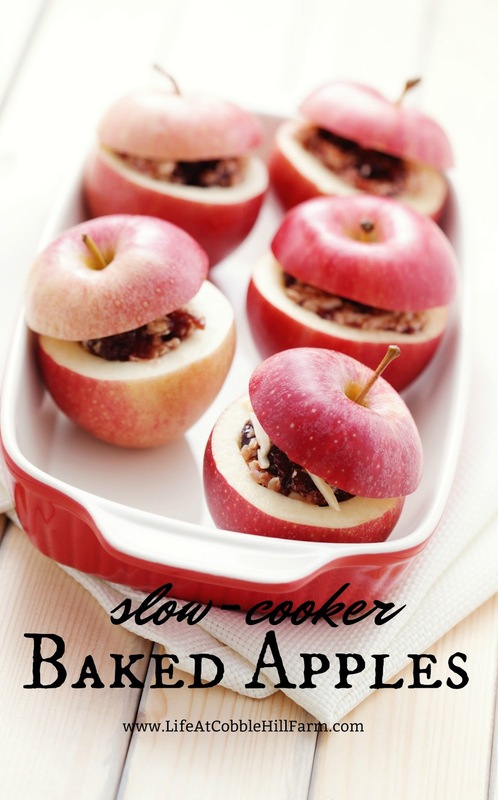 Pour the juice or cider in the bottom of the slow-cooker and set the apple bottoms in the slow-cooker, scooped side up. Fill the scooped out center with the raisins & walnuts, dividing them evenly. 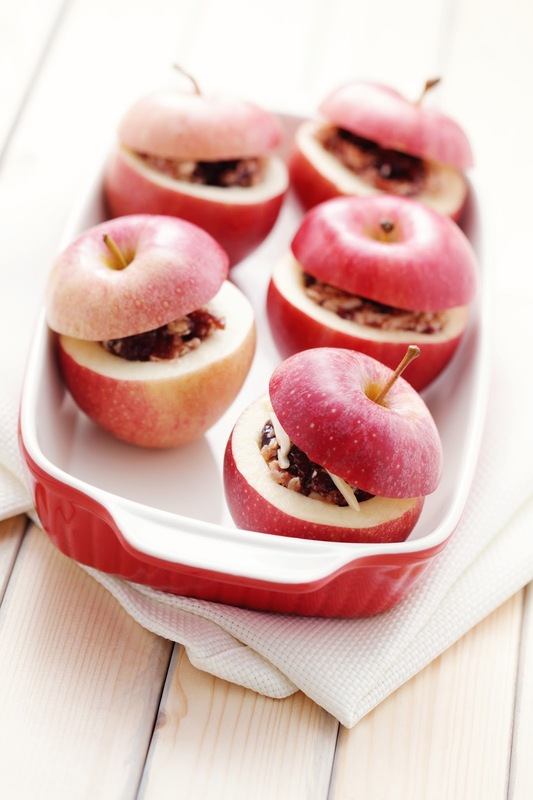 Pour 1 Tablespoon of melted butter over the walnut-raisin mixture of each apple. Pour 3/4 teaspoon of maple syrup over the walnut-raisin mixture of each apple. 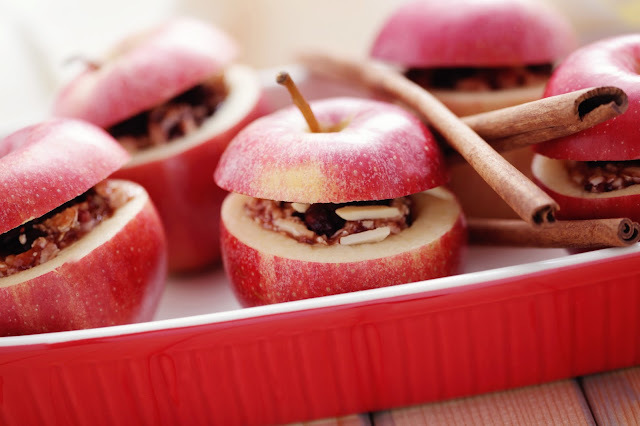 Sprinkle the apple fillings with cinnamon. 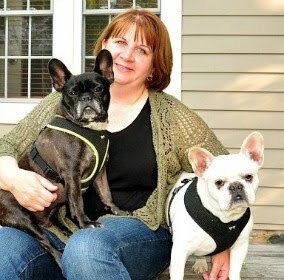 Top each with their previously cut off tops. Cover and cook 2 1/2 - 3 hours on low, until apples are tender. Your house will smell ahh-mazing!!! Remove the apples using a spatula. Serve.